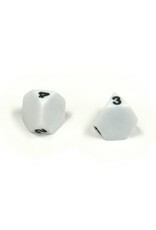 Unlike the standard d4, which is a regular tetrahedron, this truncated tetrahedron design allows the numbers to face up. 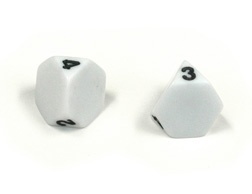 The die will occasionally land with a large blank face up, in which case you can either roll again or consider it a "wild card" roll. Approximately 17 mm across. Available in black, white, red, green, or blue.